Leading Manufacturer of 40 w solar integrated street light and 60 w integrated solar street light from Bengaluru. GENTREX- I SERIES LED SOLAR INTEGRATED STREET LIGHTS is the technology of obtaining usable energy from the light of the sun using semi conductor materials an this is energy efficient lighting technology. Lokozo lights are a range of high-quality luminaries designed to reduce lighting costs without compromise to the visual quality of outdoor environments. 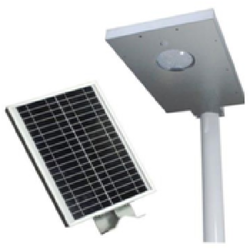 Looking for Integrated solar street lights ?